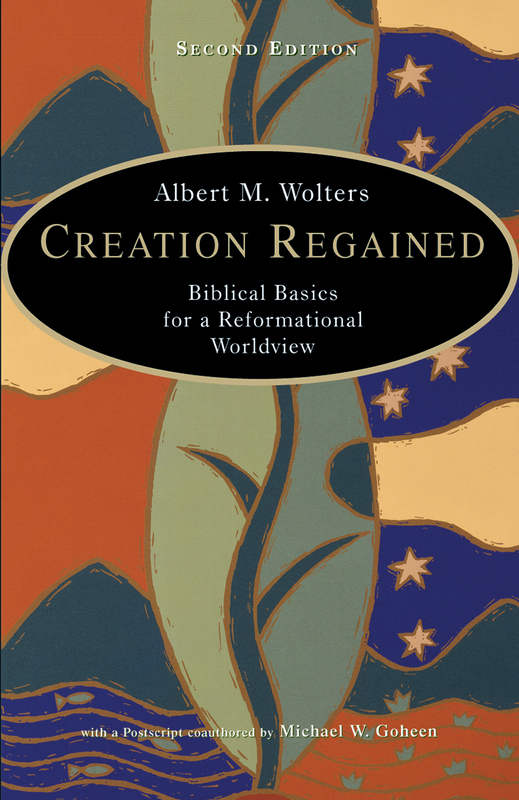 Wolters, Albert M. Creation Regained: Biblical Basics for a Reformational Worldview. Second Edition. Grand Rapids: Wm. B. Eerdmans, 2005. 143pp. $14.00. Post-Christendom approaches to culture generally fall into two broad categories that find their source in Reformation thinking—so-called “two kingdom” doctrine and what has come to be called the “transformationalist” view. Traditionally, the two kingdom view represents the thinking of German reformer Martin Luther, while transformationalists trace their lineage to French reformer John Calvin mediated through the teaching of Dutch-reformed theologian Abraham Kuyper. This is particularly true for the so-called Neo-Calvinists. Among such theologians is Albert M. Wolters, who seeks to articulate a “reformational worldview” in Creation Regained: Biblical Basics for a Reformational Worldview. Wolters is Professor of Religion and Theology at Redeemer University College in Ancaster, Ontario. He is a student of Henry Stob, former professor at Calvin College in Grand Rapids, Michigan, a bastion of Neo-Calvinism. Creation Regained was originally published in 1985, having been translated into eight different languages, and its second edition appeared in 2005. Wolters very much reflects Kuyper in the aim of his book, which he says “is an attempt to spell out the content of a biblical worldview and its significance for our lives as we seek to be obedient to the Scripture” (1). This is not just any “biblical worldview,” however; Wolters specifically calls it “reformational” and in particular ties his understanding to the Dutch reformed movement. Before he articulates exactly what this worldview is Wolters sets out to define the concept of worldview as “the comprehensive framework of one’s basic beliefs about things” (2), exploring each of the elements of this definition in the first chapter. He argues that one’s worldview “speaks centrally to everything in our life and world, including technology and economics and science” (8), again reflecting the teaching of Kuyper. He repudiates what he calls the “dualistic worldview,” which distinguishes between “sacred” and “secular.” Instead, Wolters’s primary thesis is that “the redemption in Jesus Christ means the restoration of an original good creation” in its entirety (12). Thus, Wolters is clearly setting out to defend a transformationalist approach to culture as opposed to the two kingdom doctrine. In his next three chapters, Wolters explores the transformationalist motif of creation (Chapter 2), fall (Chapter 3), and redemption (Chapter 4), developed first by Herman Dooyeweerd, a disciple of Kuyper. Creation, Wolters argues, is “the correlation of the sovereign activity of the Creator and the created order” (14), and thus it is intrinsically good. This truism extends beyond simply what God has directly created to “the structures of society, to the world of art, to business and commerce. Human civilization is normed throughout. . . . There is nothing in human life that does not belong to the created order” (25). In fact, the original creation was essentially empty, and “people must now carry on the work of development: by being fruitful they must fill it even more; by subduing it they must form it even more. Mankind, as God’s representatives on earth, carry on where God left off” (41). This objective is known as the “creation mandate.” Wolters argues that the history of mankind has been a progressive “unfolding” of God’s desire for the universe (44ff). He asserts that despite sin, man’s cultural production will climax one day in “a new heaven and a new earth” that will maintain an “essential continuity with our experience now” (48). Thus Wolters reasons for an essential goodness of creation, including later human cultural developments. Although creation itself—and by extension culture—is inherently good, mankind’s fall into sin did have certain consequences, what Wolters describes as “catastrophic significance for creation as a whole” (53). Sin created the possibility of perversion of God’s creation. However, he is quick to insist that “sin neither abolishes nor becomes identified with creation.” Rather, it “introduces an entirely new dimension to the created order” (57). In order to explain the relationship between the intrinsically good creation and the effects of sin, Wolters introduces the ideas of “structure” and “direction.” Structure “refers to the order of creation,” the natural creation of God (59). Direction is a relationship toward or away from God. “Anything in creation,” according to Wolters,” “can be directed either toward or away from God—that is, directed either in obedience or disobedience to his law” (59). The structure of creation itself presents limits as to how warped it can be turned, which is what Wolters describes as “common grace” (60). This framework allows him to discuss elements in culture that in themselves are rooted in the created order (structure) but nevertheless have been used in ways contrary to God’s will (direction). Creation, Wolters insists, was made good, but since the fall mankind has directed various elements of creation away from God. God’s desire is to redeem these elements and redirect them. He argues that “dualists” often reject the structure instead of simply dealing with its direction. The “reformational worldview,” according to Wolters, seeks to redeem elements whose structures are rooted in the created order and thus good, but whose direction has been warped by fallen mankind. “The original good creation is to be restored” (71). This, according to Wolters, extends to all realms of human development including marriage, emotions, sexuality, politics, art, and business. This is God’s plan, according to Wolters, and it is also the mission of all Christians: “The obvious implication is that the new humanity (God’s people) is called to promote renewal in every department of creation” (73). In his final chapter, Wolters explores how this approach will affect Christian living. He makes clear that redemption implies fundamental transformation or “inner revitalization” (89), and that this involves every area of life. Here he specifically applies Kuyper’s principle of “sphere sovereignty,” in which this renewal occurs within its original context. This means that in order to redeem all of creation, Christians must be active in all spheres so that true transformation can take place, and in the rest of the chapter he explores several specific test cases including aggression, spiritual gifts, sexuality, and dance. Wolters’s perspective has an overall ring of truth to it, but he nevertheless fails to recognize several key distinctions in his argumentation. First, Wolters fails to distinguish between God’s creation and man’s creation. He often conflates the two categories, equating the intrinsic goodness of God’s handiwork with that which mankind produces. He is correct that everything God creates is intrinsically good and that even the act of human creation is a good thing. However, to insist that the product of man’s hand is therefore also always intrinsically good is to slide dangerously close to Pelagianism. Second, Wolters fails to distinguish between what might be called elements and their forms. He may be correct in that the basic elements of human civilization are good, but the forms they take may be intrinsically evil. His structure/direction categories are actually very useful and have the potential of helping to distinguish between elements (structure) and forms (direction), but he often fails to do so by miscategorizing forms as elements. He lists several different “structures” that Christians may face, but some of what he lists is actually the form (the direction) of a more basic element (structure). For example, he lists technology as a structure, but technology is actually already a direction itself; it is a form of the more basic element of communication. The same is true for dance. In short, Wolters’s structure/direction categories are a good starting point, but the situation is actually often more complex. Nevertheless, Creation Regained does provide a clear and engaging portrait of the Neo-Calvinistic transformationalist approach to culture. 1. Precisely because Wolters offers the concepts of structure and direction, I didn”t feel the Pelagian danger you did in his praise of mankind”s creation. His categories—CFR, structure/direction—make it possible to recognize both good and bad in human creations. Indeed, without categories like his to explain why unregenerated mankind can create good, we”re stuck ascribing goodness to something whose source is not God. Perhaps I”d need to see a few more examples of what you mean. 2. I”ll grant that John Frame, for all I appreciate in him, seems to caricature the Two Kingdoms view in a recent book. But having recently made some soundings in Van Drunen”s two-kingdom talk, I”ve been alarmed. Would you also care to offer an example of Wolters” 2K caricaturing? Or do you look to a 2K model other than Van Drunen? 3. It does seem that methodological controls for determining what counts as a structural element and what is a direction are difficult to come by. I”m inclined to call technology and dance structural elements that can be bent in wrong directions, but I”ll admit I can”t say much to defend that thesis against your charge that communication is more basic—at least when it comes to dance. Technology I”ve thought about more. I see it as the outworking of the creation mandate; if we are to subdue the earth and rule it, we”re going to need tools. That”s technology. That”s why I see it as basic, something structural, something programmed into God”s creation. I think technology, and not just the informative content it now commonly delivers, can be bent in a wrong direction. Thanks, Mark. Again, I think Wolters” categories are helpful, but I think his miscategorization of things is where he is in danger of denying morality in human action. I”m too much convinced that the medium is the message (or that we shape tools and tools shape us) to put a whole lot of human-created things in the “structures” category. Once a human produces a medium of communication, it already is a direction. As to approaches to culture, I definitely lean more toward 2K than Neo-Kuyperian. It has some problems, to be sure, but it appears to fit more with others of my theological and philosophical commitments than the alternative. The two-kingdom theology is expressed most popularly today by Michael Horton (Where in the World Is the Church? A Christian View of Culture and Your Role in It), D. G. Hart (Secular Faith: Why Christianity Favors the Separation of Church and State), Jason Stellman (Dual Citizens: Worship and Life Between the Already and the Not Yet), and David VanDrunen (Natural Law and the Two Kingdoms: A Study in the Development of Reformed Social Thought; Living in God’s Two Kingdoms: A Biblical Vision for Christianity and Cutlure). Defined that way, it”s the activity of making tools that”s structural. We will make tools. God designed us to do so in order to fulfill His Creation Mandate—to subdue our world and take more and more dominion over it (or, as Crouch puts it, to “make something of our world”). There is always some goodness involved in making a tool, because tool-making is part of that original divine design. But the individual tool, made as it is by fallen humans, will contain direction as well as structure. I”m totally with you in saying that our tools shape us and that (to tone down McLuhan”s memorable hyperbole a bit) media themselves carry messages. I think our evangelical world is dangerously and sinfully naive to flout this truth. But I don”t think Wolters is dangerous on this point; I think he provides the tools (ahem) necessary for persuading our brothers to obey God”s “creational norms.” Structure and direction help us recognize the good and the bad in all human creations. To adapt Solzhenitsyn, the line between good and evil runs through every tool. So my iPad is not all structure and it”s not all direction. It”s a mix, making some good things easier to do and some bad things easier; making some good things harder and some bad things harder. As Crouch says, it helps define the horizons of possibility and impossibility for me. I actually think that you in particular should view the concepts of structure and direction as friends: they help you enlighten people who view music as totally neutral. Music is intrinsically good (not neutral) because it was programmed by God into His “very good” creation (cf. Gen. 4 and Jubal), but it can be and often is twisted in the wrong direction. One more thing… I see 2K running in a direction I know you don”t want to go: placing music (excluding church music) into the realm of natural law and out from under the direct, verbally explicit rule of Christ. So I”m sure I need to do some more reading to figure out what makes you lean that way. These are important issues, Scott. Thanks for doing your homework and talking them through with me. Thanks for the interaction, Mark. A few quick thoughts. First, I absolutely do like Wolters” concept of structure and direction; I think he”s exactly right, and those categories are extremely helpful. What I am concerned about is what he puts in each category, as I say in the review. He puts far too much there. So I agree with you that the act of creating technology is structural, and the raw materials with which we create technology is structural, but that which we create as moral human agents is already directional. So I would disagree with you about your ipad: it is already directional. It shapes meaning, understanding, perceptions, the moral imagination, etc. in certainly ways inherent to what it is as a medium of communication. Second, I am actually comfortable with the idea of natural law, although not necessarily all of its implications. I am very comfortable placing music in that realm and evaluating it this way. And while it is true that the theory of music was created by GOd and therefore good, any song (or, by extension, genre) is a human creation and therefore either good or evil. But this is where I think you may have succumbed to caricatures of 2K: the idea of natural law does not imply that God is not ruler of all; it is HIS natural law, after all. Natural law does not exist somehow outside the sovereign rulership of God. Where it gets sticky, and I think this is where Kuyper had problems, is in saying that CHRIST rules all. “Christ” is a term explicitly referring to the redemptive role of the second person of the godhead. To say that Christ rules all is to imply that all has been redeemed by Christ. There is a difference, in other words, of saying that God rules all, in terms of his sovereign, providential oversight, and saying that Christ rules all, which he will not until his return when everything is subjected to him. At the end of time, everything not sent to eternal damnation will indeed be redeemed by Christ, including creation. That is not the case now. Of course, this gets into eschatological and kingdom issues, which is exactly the point. I am correct in interpreting that Creation Regained is from a distinctly postmillenial perspective?